HubSpot announced today the launch of Content Strategy, a new tool that helps marketers discover and validate topics to write about that match the way people now search and buy. Google receives more than 3.5 billion search queries per day. For years, the best way to solidify a spot at the top of the results was to focus on creating multiple pieces of content focused on niche, long-tail keywords. Search engines have gotten much better at serving up results that provide value to the searcher, making it much harder to build authority solely based on those specific keywords. A new topic-based model on creating content, called topic clustering, can help adapt and provide better results for people searching, and for marketers creating content. This approach helps marketers drive more traffic and also serves the search engine with better information architecture and more content the crawler can index. Most SEO tools today focus on the technical aspects of SEO, but don’t give marketers the tools to discover new topics to write about and build and structure that content. Content Strategy is the first tool to integrate the methodology right into the tool so marketers can not only learn what works for SEO, but easily apply it without an SEO consultant. The tool uses machine learning to help surface recommendations that are relevant to a user’s business, and content that will perform well in search. Discover topics to write about that are surfaced by HubSpot’s machine learning technology, then easily organize them into a topic cluster. 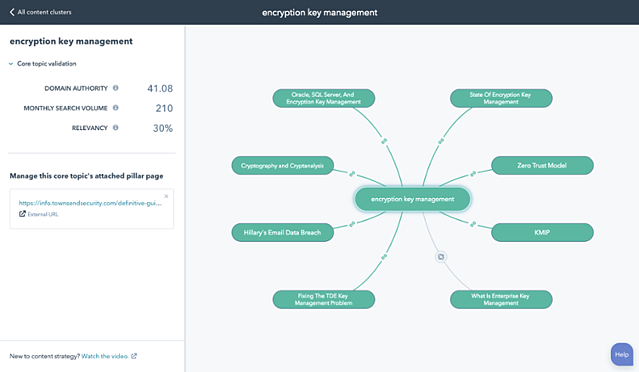 “The Content Strategy tool has been great for helping us map out the content that we will be making,” said Ken Mafli, Demand Generation Manager at Townsend Security. “It has insights into the metrics we need to make decisions about which content to create, and maximize the time we spend creating content.” Three months after adopting the Content Strategy tool, Townsend Security has seen a 55% jump in organic search traffic, and in March they set a new record for organic search traffic with an 80% growth in leads. Learn more about the tool and see how it can help your own marketing efforts here.